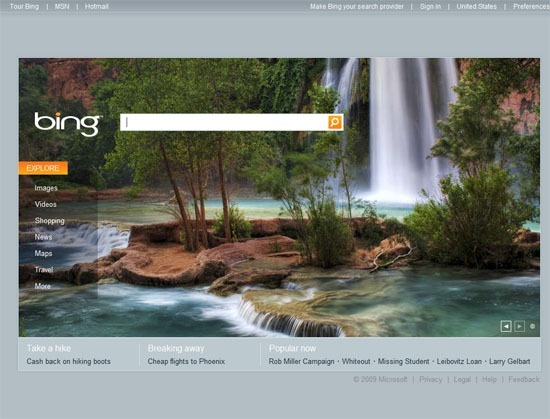 After MSN Search and Live Search, Bing (first known under the code name "Kumo") has been Microsoft's search solution since 2009. Bing is often referred to as the leading Google competitor and also supplies the Yahoo search. According to ComScore, Bing and Yahoo together had a market share of 32.6% of US Internet searches in the US behind Google (64.5% of US search market share) in 2015. Bing calls himself a "decision engine". Early on, Bing relied on some of today's common search functionalities, such as the display of search suggestions when entering a search term, a list of related searches or a listing of concrete search results directly on the results page. In 2013, Bing introduced its Knowledge Repository, also known as Bing Satori, which first links the objects to information from the Britannica Online Encyclopedia. Currently (2016), Bing Satori obtains the facts from Wikipedia. Personal information is based on Wikipedia and LinkedIn. »Bing (known previously as Live Search, Windows Live Search, and MSN Search) is a web search engine (advertised as a "decision engine") from Microsoft. Bing was unveiled by Microsoft CEO Steve Ballmer on May 28, 2009, at the All Things Digital conference in San Diego, California, for release on June 1, 2009. Notable changes include the listing of search suggestions while queries are entered and a list of related searches (called "Explore pane") based on semantic technology from Powerset, which Microsoft purchased in 2008. On July 29, 2009, Microsoft and Yahoo! announced a deal in which Bing would power Yahoo! Search. All Yahoo! Search global customers and partners were expected to have made the transition by early 2012. Walcher, Stephan (21/05/2009): »Microsoft wird allem Anschein, Kumo, die neue Version von Microsoft Live Search bereits nächste Woche auf der All Things Digital präsentieren. Mit Hilfe von der vor kurzem aufgekauften Firma Powerset will Microsoft mit Kumo seine bisher wenig erfolgreiche Suche, Live Search zu neuen Erfolge bringen. Anders als Google soll Kumo nicht die Häufigkeit von Worten sondern den Sinn von Sätzen verstehen. Klingt ein wenig wie die vor kurzem zum öffentlich freigegeben Suche Wolfram. 2. Best Match: It is an algorithm created by Microsoft pushes the suggested search input for the user based on personal search history and interest. 3. Deep Links: Let user preview pages before they click. 4. Instant Answer: It would allow Bing quickly display the most relevant answer based on query. 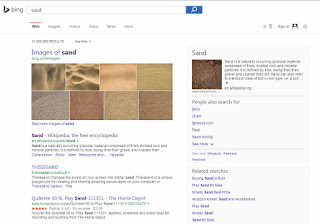 It means that if you ask some basic knowledge on Bing, it would display answers itself besides the search results.